As the most popular sport in America, football tickets can pack a serious punch to your wallet. But with these buying tips from SeatGeek, you’ll be armed with the tools to find the best deals to see your favorite NFL team. Tip 1: Wait until a few days before the game to buy tickets. Just like food with an expiration date, ticket prices tend to drop in the days leading up to an event as sellers try to offload them. While there may be less inventory to choose from, those tickets that do remain will most likely be at a discounted price. In the case of the Bears last season, the average ticket resold for $249 three weeks out from a game, but just $195 three days before the game. That’s a drop in price of 22 percent! Tip 2: Check out the opponent. If you just want to see the local team play, then keep a close eye on the schedule, as prices do vary widely depending on who is the opposing team. Teams with a national following (Cowboys, Steelers) and teams that are successful (Seahawks, Patriots) tend to drive up prices more than the teams that have struggled as of late. Opponents to look for when searching for a great deal include the Buccaneers, Browns, Rams and Jaguars. Tip 3: Compare tickets by value instead of price. choice. But those who can afford to spend a little extra should attempt to find the best value. A fan may be able to find tickets that cost $10 more, but are 20 rows closer to the field. Or instead of buying tickets in the end zone, for $10 more a fan can sit along the sideline near midfield. 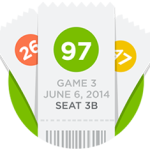 We at SeatGeek actually developed a tool for this called Deal Score, which sorts tickets based on their value, instead of strictly their price. Look for the green dots on our map to signify a great value. Tip 4: See where you sit. With SeatGeek’s seat views, you don’t have to guess what you will see from their seat, you get to see an actual image of the view. You can compare different sections to find what angle of the field you think is best. Tip 5: Make sure to buy from a legitimate source. To avoid being the victim of a ticket scam, users should make sure they purchase their tickets from a legitimate source like SeatGeek, that has guarantees that come along with the purchase of a ticket. This way even in the very small chance that a ticket doesn’t work, the buyer is compensated accordingly.